My name is kateinkew and I’m a Twitter addict. There, I said it. Now I need to start paying attention to Look Up Stop Texting. Look Up Stop Texting (LUST) founder Cat Greenleaf is a recovering Blackberry addict. She launched the website (or perhaps the ‘movement’) after she realised that she was missing important moments because her eyes were focused on a small screen, not the world right in front of her. The mission of LUST is to get you to put down your phone and live in the actual moment rather than the virtual one. LUST fans offer some tips for putting down your phone (can you believe it has come to this?!) and contribute to a chat page to share what they saw when they weren’t playing with their phones. I may not be quite ready to quit posting bits from my day to Twitter but LUST has made me aware – next time one of my children asks me something when I have my iPhone in hand, I won’t answer with “Hang on! 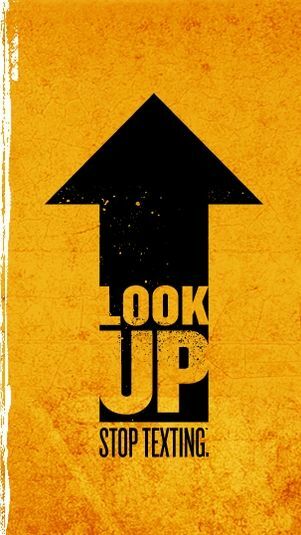 I just have to check this…” Instead, I’ll look up. If you need more reminders, deck out your baby in a ‘Put it Down’ onesie or t-shirt. Fittingly, ‘Put it Down’ iPhone and Blackberry cases are also available. Onesies, t-shirts and phone cases are all US$20 each. LUST ships to Australia.